Figs, the symbol of sweetness, fertility and abundance, are moist and succulent fruits grown on the ficus tree, scientifically known as Ficus Carica. These small fruits are enjoyed in both their fresh, raw form as well as dried. Dried figs are sweet and are often eaten as a favorite snack between meals. Put dried figs into yogurts, cereals and desserts for enhanced flavor and added nutrition. Figs are very nutrient-rich. Adding dried figs into your daily diet can help you meet many of your body's essential nutrient needs. Eating the flower or the fruits is a healthy option for anyone. When figs are dried, they become firmer than fresh figs and the natural sugars become much more concentrated, creating a sweeter taste. One serving of dried figs can provide a good amount of calories, essential vitamins and minerals, and energy-boosting carbohydrates while still maintaining a naturally low amount of fat. 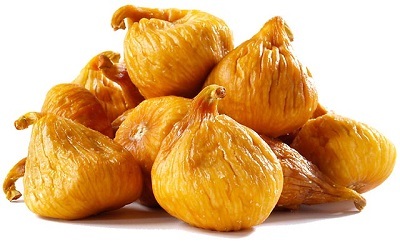 The nutritional values of dried figs vary greatly depending upon the quality of the fruit and the serving size. Fresh figs have a very short shelf life, which is why many prefer to eat them dried. Whether you cut the figs into parts or eat them whole you will still receive the nutritional benefits from these seedy fruits. The following table measures the nutritional value for one cup of uncooked, dried figs. Heart health. Dried figs are very low in sodium, but have high levels of potassium and magnesium. These nutrients work to lower blood pressure while the dietary fiber works to lower cholesterol. The antioxidants in figs help prevent the buildup of plaque in arteries and veins. Bone health. Calcium and potassium work together to promote healthy bone density and strength. Potassium helps to ensure that your body does not lose too much calcium through urine. With more calcium in your body, your bones will become stronger and your risk of arthritis and osteoporosis will decrease. Diabetes and weight control. The leaves from a ficus tree can be consumed just as dried figs can to help those with diabetes or those on a weight loss program. The natural sugars and dietary fiber control blood sugar and insulin levels. The dietary fiber is a huge benefit for those on a weight loss plan as it helps the body metabolize food more efficiently. Other benefits. High levels of iron and folate make dried figs a great choice for those who are anemic as well as for women who are pregnant or menstruating. The antiseptic and emollient properties are helpful in treating acne, and consuming dried figs can help with bowel issues like constipation. If you have a fig tree at home or if your grocery store sells them regularly, you can dry figs yourself at home to store for later use. Gather a bunch of ripened figs. Wash the figs thoroughly and be sure to dry them well on a towel. Cut each fig in half. Place each half onto wooden, cooling or dehydrating racks and place them where they will get the most direct sunlight and cover them with a cloth to keep insects off. If you don't live in a sunny area or the humidity is high, you can dry them in the oven on the lowest heat setting. Leave the figs out in the sun during the day, but bring them in at night as dew can ruin them. After about 2 days the figs should be dry. If the outer covering feels leathery, but they bend easily between your fingers then they are ready. The insides should be soft but not juicy. Summer is the best time to dry figs. Store them in the freezer or refrigerator until you are ready to eat them. Clean and slice all vegetables and cut chicken into 2 inch strips. Stir-fry the chicken in olive oil over medium heat for 3 minutes. Add all of the vegetables and seasonings except the figs, parsley and basil. Continue cooking for 15 minutes, then add the figs, parsley and basil. Mix all ingredients well. Add the wine, cook for another 2 minutes. Serve with whole grain rice and green salad. Put the figs and water into a saucepan and bring to a boil. Reduce the heat to a simmer, cover, and let stand for 20 minutes. Add all ingredients except for the almonds and stir gently. Cover the figs and simmer for 20 minutes or until the figs are plump and look transparent. Cool them in the corn syrup and add some water if needed. Insert an almond in each fig before serving. Serve with chicken, beef or pork.